1 x Vac Adapter, Compatible with all kite pumps and all vacuum bags, made from durable plastic and has a keychain hole for safe keeping. with a lockable one way valve. The X3 PBK kit is designed especially for kite surfing, kite boarding and snow kiting. Using our uniquely designed vac adaptor with your existing kite pump, you can easily reduce the size of up to three kites to take on your travels without the need of a vacuum. Our extra strong and durable kite compression bags are designed specifically to make kites up to 16m2 fit into travel bags and provide extra protection from damage, dust, dirt and moisture. 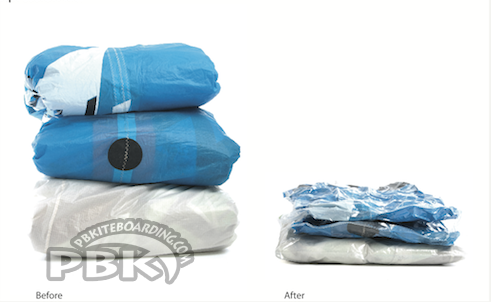 Clothing can also be placed into the kite compression bags, saving more space. The X3 PBK kit is designed especially for kite surfing, kite boarding and snow kiting.compression bags, saving more space. Place your kite and/or clothing into the X3 PBK kite compression bag and seal the bag. Twist the valve to the ON position. Connect the vac adapter to the hose on your air pump. The hose must be connected to the 'deflate' side of your pump. Use the vac adapter to make a seal with the valve on the kite compression bag and pump the air out. Twist the valve to the OFF position once the kite's size is reduced. How do I look after my X3 PBK kite compression bags? Store where temperatures do not exceed 100 degrees F. or fall below 0 degrees F, out of direct sun light and unfolded. 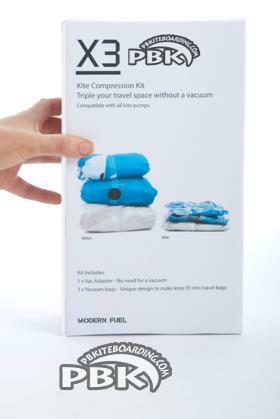 How long will the compression bags? Lets say you go on two trips a year and looked after according to the care instructions above, the bags will last approximately 4 - 6 years. 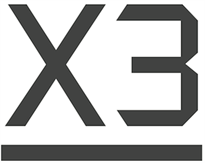 Why should I buy the X3 kit and what are the advantages? Take three kites on holiday. Put a kite in your carry on luggage. Easy to compress your kite on the way home. Save weight with a smaller kit bag. Use the smaller stealth/Golf kit bags.